Federal, territorial and tribal governments voiced concerns through the formal comment process. The Trump administration, in its push to allow oil drilling in the Arctic National Wildlife Refuge, has largely ignored impacts that the development would have on Canadians, said tribal, territorial and national government officials from that country. In formal comments submitted to the Bureau of Land Management, Canadian governments from the national level to the tribal First Nations level called for a supplemental environmental impact statement to address what they characterized as serious gaps and flaws in the draft EIS examining effects of ANWR oil leasing. “We conclude the draft EIS is so deficient, and its approach to the impacts analysis is so deeply flawed, the Bureau of Land Management must revise and reissue the draft EIS for public review if it is to move forward with an inclusive and transparent regulatory process,” said the submission from the Vuntut Gwitchin Government in Old Crow, Yukon Territory. The Gwich’in are members of an Athabascan tribe indigenous to northeastern Alaska and neighboring areas in Canada’s Yukon and Northwest Territories. Along with the unanimous call for a supplemental EIS, the Canadian governments all accused the BLM of glossing over the harm that would befall citizens on their side of the border. “As it stands, the Canadian communities who will be most significantly impacted by the leasing and subsequent activities will receive none of the benefits that could lend to mitigation of these impacts. These effects should be examined,” said the Government of Yukon’s submission. The Canadian documents were sent to the BLM by the March 13 deadline for public comment on the draft EIS. Impacts to the Porcupine Caribou Herd, which roams between northeastern Alaska and northwestern Canada and is the subject of a 1987 U.S.-Canada conservation treaty, are the most prominent concerns raised by the different levels of government. One Canadian tribal leader testified at a Congressional hearing on March 26 about the importance of the herd and to indigenous people on both sides of the border. “If you drill in this sacred place. it will destroy the caribou and therefore destroy the Gwich’in,” he said. Transboundary concerns raised by the Canadian government extend beyond caribou. In their official comments, they raised concerns about polar bears, wetlands management, migratory birds and climate change, among other subjects. 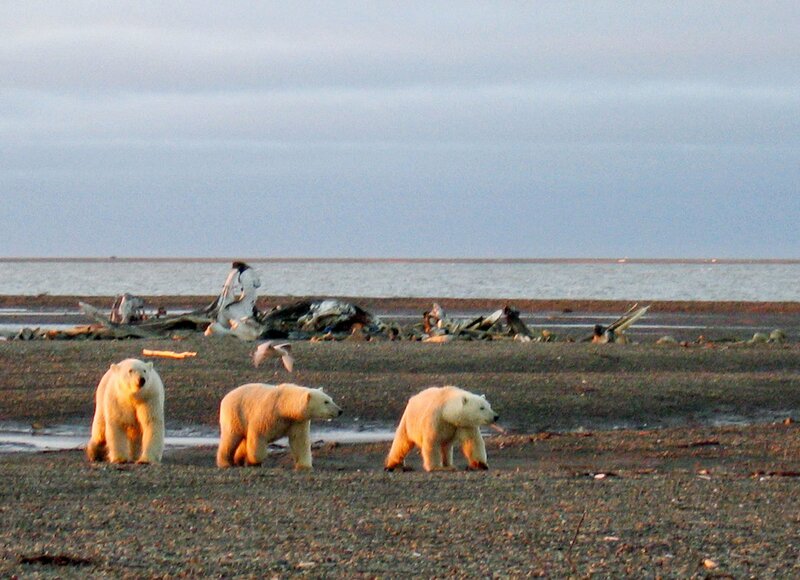 The BLM’s draft EIS fails to even acknowledge that polar bears roam between Alaska and Canada and are thus a shared responsibility and resource, the Canadian comments said. Canadian officials are not alone in expressing concerns about transboundary impacts of ANWR oil development. Sixteen state attorneys general submitted a 143-page document to BLM that criticized the draft EIS for failing to consider long-distance impacts of ANWR development. “The effects of the proposed Leasing Program will be felt in other states,” the document said. ANWR oil would likely be processed in Washington state refineries, “harming air quality, public health, and safety,” the document said. ANWR leasing has “unacceptable ramifications” for the global climate, including the climate of the 15 states and D.C., the document said. And ANWR leasing “could have grave consequences for migratory birds that travel to other states on their journey to and from the Coastal Plain,” it said. The attorneys general collaborating on the document are from Washington, Massachusetts, Delaware, Maryland, Maine, Michigan, Minnesota, New York, New Jersey, North Carolina, Oregon, Pennsylvania, Rhode Island, Vermont, Virginia and the District of Columbia.